For more information about upcoming shows please contact the Gallery. A year ago we were invited by James Lamb who runs a charity in Nepal to go trekking with him and his partner Tashi with a view to creating some paintings to raise money for their charity, the little Sherpa foundation. Initially the charity was to help the widows of those Sherpa guides killed on Everest in 2014 and after the earthquake in 2015. However during the intervening years it has expanded to help rebuild the school in Phortse and now has plans to build a health centre there. Tashi and James also run Tengboche trekking, a company that creates employment for local guides and gives the profits from the treks to the little Sherpa foundation. A really exciting prospect. An exhibition of work by two great friends, renowned Metal Sculptor Helen Denerley and celebrated Irish poet Michael Longley. Each will create work in response to the other’s Art . The second exhibition at Rhue by the wonderful French Landscape painter Jean Michel Bénier, who shares his life between the mountains and the sea, painting and writing. For 40 years, he has exhibited in Switzerland, California and France. ...."I have a sneaking idea that you have to use two ways of looking if you want to give a good feel for 3 dimensions. The mind and eye, can then appreciate the distortions inevitable in each type of projection, and make allowances for it. I enjoy going from one projection to the other and back again, just to appreciate the artifices involved in flattening 3 dimensional reality onto a 2 dimensional picture. Notice how the linear pictures distort the foreground, and one loses sense of direction. The circular pictures though do those things very well, but curve the horizon, and flatten out the sky. As the sky doesn't usually hold much information it works very well." Thought provoking pieces and installations. A different view on Art and how to look at it. RhueArt Gallery “Greenland: At the Margins"
Jane Rushton and Rhea Banker spent a period of time together in and around Ilulissat Kangia and Eqip Sermia, on Greenland’s west coast, gathering material for a project that would bring their two artforms together in dialogue. Of course, the stunning landscape of west Greenland was a huge inspiration but, more particularly, they were each drawn to the complex relationships between the seemingly permanent geological elements of nature and the more transient elements like ice, water and the lichen flora. Eleanor is best known for her dynamic teaching at Bridge House Art in Ullapool and at Leith School of Art in Edinburgh, an inspirational and feisty tutor this is a rare chance to see the huge repertoire of her techniques employed to create her own enigmatic images. Landscape paintings and cut out pieces by James Hawkins. Helen Denerley’s up cycled metal sculptures These amazing works will be on display around the garden and videos of her working practise will be on shown in the gallery. Jean Michel Benier lives in France and regularly visits Scotland to make plein air watercolours exploring the coast line from the land and the sea. 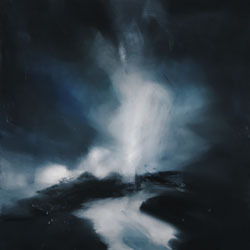 His paintings capture weather and shorelines, mountain and seascapes with a minimal elegance. These amazing works will be on display around the garden and videos of her working practise will be on shown in the gallery. Part of the world wide centenary celebrations of the birth of the American abstract expressionist painter Jon Schueler Jon lived in New York but spent several months throughout each year painting from his studio in Mallaig. His luminous paintings celebrate the ever changing light of the west coast. Work created during a visit to northern Uganda. The research visit was sponsored by the Refugee Law Project, a Ugandan organisation that supports asylum seekers, refugees, displaced people and their host communities within Uganda. 10% of the value of sales from this exhibition will be donated to RLP to support the National Peace and Memory Documentation Centre and its vital peacebuilding work. RLP will also be glad of any direct donations: see their website www.refugeelawproject.org. Shortlisted for Wildlife Artist of the year Award. Katy observes and records the unique moments that nature reveals. MOLTO IN PARVO miniature sculptures by HELEN DENERLEY Specially commissioned for this exhibition, one of Scotland’s foremost sculptor’s has created a series of miniature animals. Rhueart was delighted to have been asked to put on an Exhibition at ART FORUM 61, A Contemporary Art Biennale in France. We showed work by Rhiannon Van Muysen, Helen Denerley, Tobias Hodson and James Hawkins at this prestigious Biennial during late June and early July. The multi venued exhibition featured more than thirty international artists; the lead artist was Gustave Courbet. Lay of the Land RhueArt Gallery New work by Rhiannon Van Muysen. Inspired by the Landscape and Geology of Northern Scotland and Iceland. Mo Farquharson and James Hawkins at The Gallery,28 Cork Street,London. Friends and contempories at The Ruskin School of Drawing and Fine Art, University of Oxford this exhibition features Mo's bronze sculptures and James' carbon fibre cut-out paintings. Morphogenesis Rhueart Gallery Tobias Hodson An Exhibition of Large and vibrant watercolours by Irish based Artist Tobias Hodson. Scottish National Galleries, Duff House, Banff.